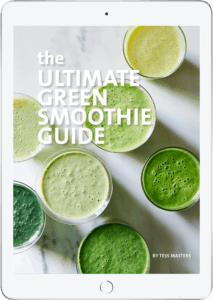 Tips for how to make plant based milks and nut milks and how to use them to make delicious smoothies, desserts, and other recipes. What are plant-based milks and nut milks? Plant-based milks, also known as “plant juices” are made by blending a nut, seed, grain, or fruit (coconut) with filtered water. Then, milks are flavored and sweetened, if desired. And, to make milks shelf-stable, they are often pasteurized and contain additives and preservatives. There is a wide range of plant-based milks available at health food stores and grocery stores. And they range from pure simple boutique products made in small batches with very few ingredients, to mass-produced products containing a lot of additives, preservatives, and sweeteners. As a general rule, the cheaper the product, the more chemicals it contains. Pure organic plant-based milks tend to be a lot more expensive. With plant-based milks, you do get what you pay for. Where do you get a nut milk bag? 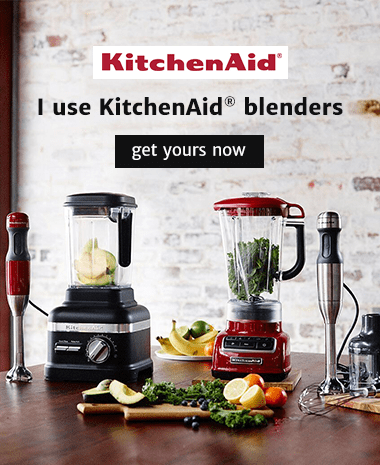 Do you need a high-speed blender to make nut milk? To strain or not to strain? How long do homemade milks keep? Even with the same base food you will find a vast difference in taste, texture and quality. A quick glance at the ingredient list on the packaging speaks volumes about the integrity of the product. As a general rule, I always look for products that use simple organic ingredients (and as few ingredients as possible) and do not use additives, preservatives, stabilizers, thickeners and sweeteners. I look for milks that contain the base ingredient (eg: almonds), filtered water, and perhaps vanilla extract, and if desired, dates or some other kind of natural sweetener. Watch out for milks that contain any more ingredients than that. And if you can’t pronounce the ingredient and don’t know what it is, odds are it’s a chemical that is not so healthy. I generally use commercial milks as little as possible. Instead, I prefer to make my own homemade nut milks, seed milks, grain milks, and coconut milk. 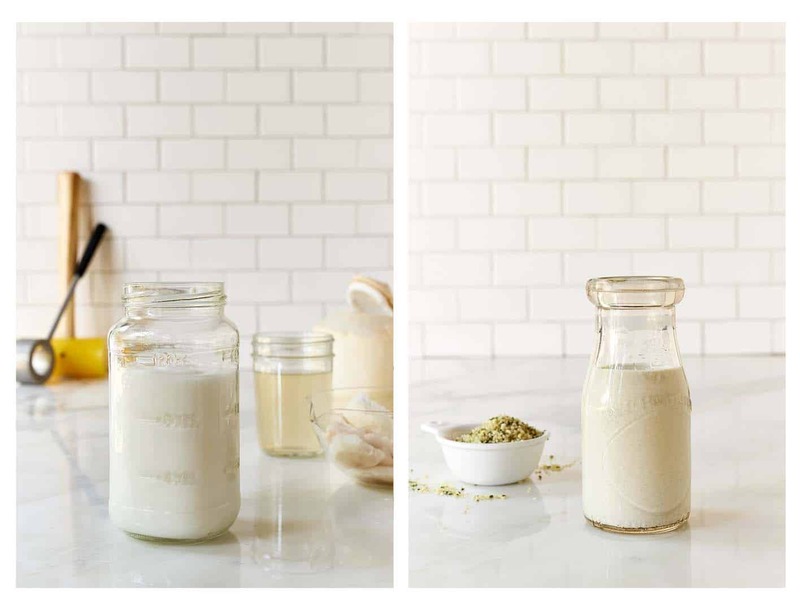 Making your own plant-based milks is so easy. You simply blend a nut, seed, grain, or fruit (coconut) with filtered water. The ratio of the food to water varies depending on the base ingredient. But, typically, it is 1 cup of food to 3 cups of filtered water. Unsweetened milk can be consumed whole (retaining all of the nutrients of the whole food), or strained to remove the pulp for a more homogenized consistency. Then, you can add any flavorings and sweeteners you like. Measure out the nut, seed, or grain and soak according to the soaking instructions. Drain and rinse thoroughly. Discard the soaking liquid (you do not want to consume the soaking liquid.) Transfer the drained food to your blender. Add the clean filtered water and any flavor enhancers. Blend on high for 3o to 60 seconds until the ingredients are liquefied. (If your blender heats the milk, don’t be alarmed—the heat won’t harm the milk). Tweak the flavor enhancers to taste and blend again. Enjoy the milk unstrained, or strain for more homogenized commercial-style milk. To strain, place a filtration bag over a large jug or bowl, pour the milk into the bag, twist the bag closed, and gently squeeze the bag to pass the liquid through. Transfer the strained milk to a sealed container and chill the fridge. The milk will keep for 2 to 3 days. It is normal for homemade plant-based milk to separate. Just shake or blend again before using. Beyond adding sweetener and vanilla extract, you can add fruit, superfood powders, spices, herbs, and juices to keep things interesting. Sometimes you have to run the blender for a couple of minutes in order to achieve the smoothest results, which warms up your blender, and thus the milk. This happens with high-speed blenders. Don’t be alarmed. The milk won’t spoil. Just chill in the fridge, or throw some ice cubes into the blender, and blast again to cool it if you’re using the milk straight away. To use the pulp, lay it out on dehydrator sheets, and dry at 115 degrees for 8 to 12 hours to use for cookies, crusts, and to fortify baked goods. Or, make a quick easy body scrub and use immediately. And, you can make them more digestible by neutralizing the enzyme inhibitors and activating the full nutrient potential by soaking the ingredients before you blend them. I recommend soaking nuts, seeds, and grains to neutralize the enzyme inhibitors and activate the full nutrient potential of the food in order to make the milks more digestible. Soaking also softens the food so that it liquefy more easily for a smoother milk. This is particularly important when using a conventional blender. Refer to my soaking guide for the specific soak times for each ingredient. and the method for soaking nuts, seeds, and grains. Where do you buy nut milk bags? Nut milk bags (filtration bags) can be purchased from health food stores, kitchenware stores, grocery stores, and online retailers. A high-speed blender yields the best results when making plant based milks. They really pulverize the nuts, seeds, and grains. Having said that, you can make milk in any conventional full-size blender. Whole, unstrained milks retain all of the nutrients of the whole food, so they offer the most nutritional benefits. However, they can have a gritty texture, and are not palatable for most people. Unstrained milks also don’t do well when used in recipes. It is best to strain plant-based milks for use in recipes. 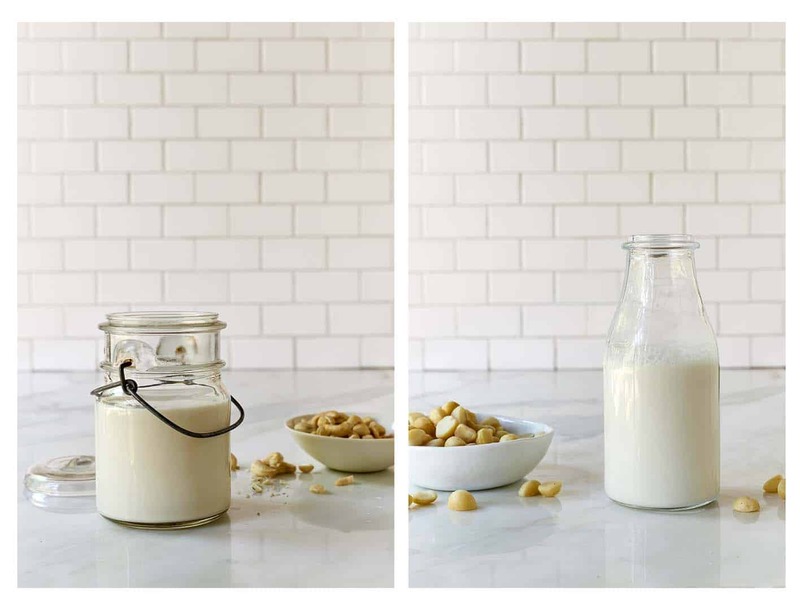 These nuts yield milks that are incredibly smooth when made in a high- speed blender. So, they do not not need to be strained. However, if you’re using a conventional blender you will need to strain them to achieve a smooth consistency. 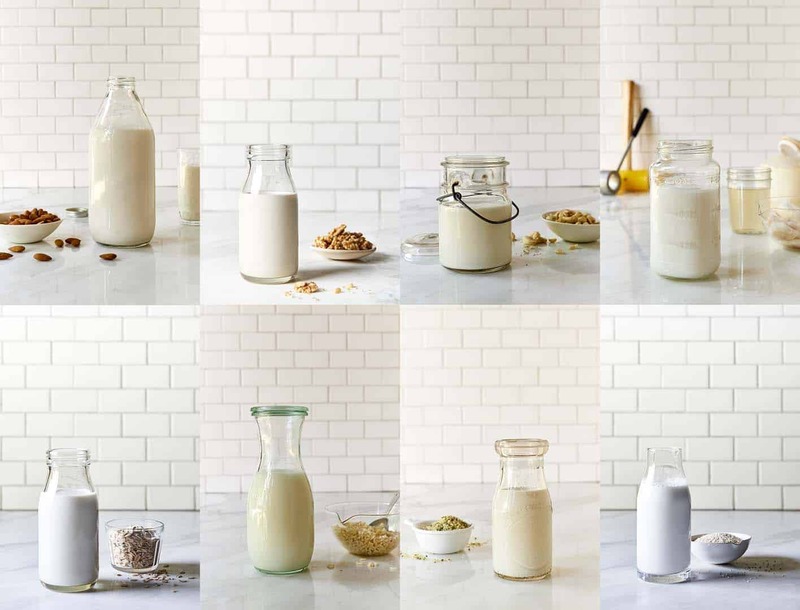 These foods yield milks with some texture. You can drink the milk like this. In fact, it is preferable as the unstrained milk of these foods retains the full nutrition of the food. However, if you want a more commercial-style milk, you will need to strain the blend with a nut milk bag. How long will homemade milks keep? If you have soaked your ingredients (and thus semi-fermented them in order to activate them), your plant-based milk will keep in a cold fridge in a glass jar or jug for 2 to 3 days. The milk will separate a little, and may get a bit of a skim on the top. This is normal. Just give it a shake or stir before using. If the milk starts to smell sour, it’s past it’s use-by date. If you choose not to soak your ingredients to improve the digestibility, the milk will keep for 4 to 5 days. Freeze any extra milk into ice cube trays to make flavored ice for use in smoothies and drinks. For nutrient diversity and culinary pleasure, I make different plant-based milks. I use a variety of plant based milks in different circumstances depending on the flavor and texture preferences. Homemade plant-based milks can curdle and separate when heated. The best way to heat for coffee is gradually on a very low heat. *If using homemade plant-based milks in recipes, use them strained. Almond milk has a mild, nutty flavor that makes it ideal for use in sweet recipes such as smoothies, desserts, pancakes, and crepes. The mild flavor makes almond milk my go-to milk for making smoothies and for topping cereals. as it pairs well with any other ingredients. Almond milk does quite well in baked goods. But, cashew milk more closely replicates the creaminess of cow’s milk. Almond milk can be a little too watery for a lot of baked goods. Having said that, I have used almond milk in muffin and bread recipes where only a small amount of milk is required with excellent results. The quality and integrity of almond milk varies dramatically. It’s important to read labels. Many brands contain additives, preservatives and sweeteners, and are made using boiled or roasted almonds. Whilst this produces an almond milk with a richer flavor, the process of cooking nuts destroys the healthy oils. It is preferable to consume almond milk made with raw almonds. Most milks have removed carrageenan (a thickening agent that has been linked to colon cancer and digestive disorders in various medical studies), but some are still using it. So, again, check labels to ensure you’re purchasing a clean product. I prefer to make almond milk using raw almonds that have been soaked and activated. Homemade almond milk is low in saturated fats and carbohydrates, and is lactose and cholesterol free. 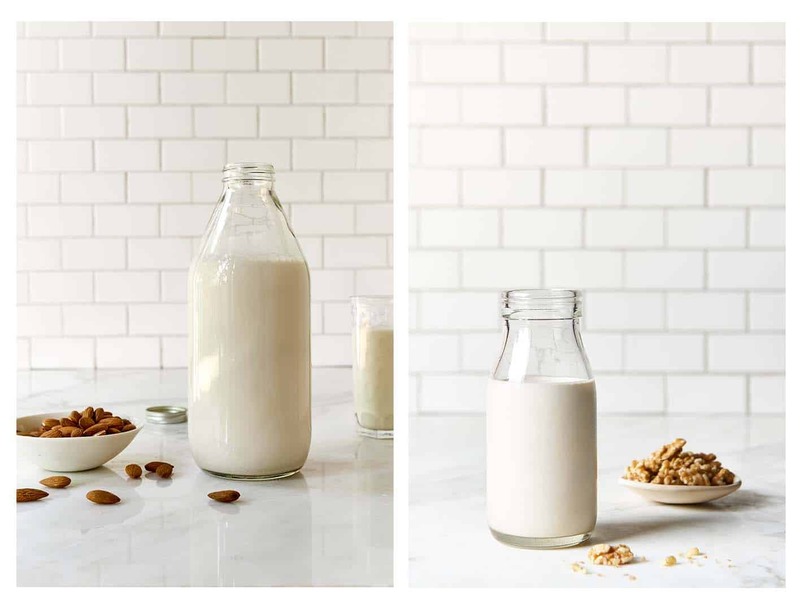 Whole, unstrained almond milk contains all of the nutrients of the whole raw almond, and is packed with protein; heart-healthy monounsaturated fats; omega fatty acids; Vitamins B, D and E; and magnesium, potassium and copper. Almonds are also one of the only alkaline-forming nuts, and contain over 20 different antioxidant flavanoids that combat oxidation and abnormal cell development. Cashew milk is rich and creamy and fairs really well in sweet and savory recipes. It is my go-to milk for dessert-style smoothies, baked goods, pancake batters, and in savory recipes. There are few brands of cashew milk on the market. Some are pure milks containing cashews and water. Other brands use a blend of cashews and almonds with a lot of additives and preservatives which produces a funky flavor. Some commercial cashew milks use a roasted cashew paste instead of raw cashews. The precious oils ion cashews get rancid when roasted. So, these milks are not health-promoting products. Read the labels so you know what you’re getting. The healthiest option is to make cashew milk. 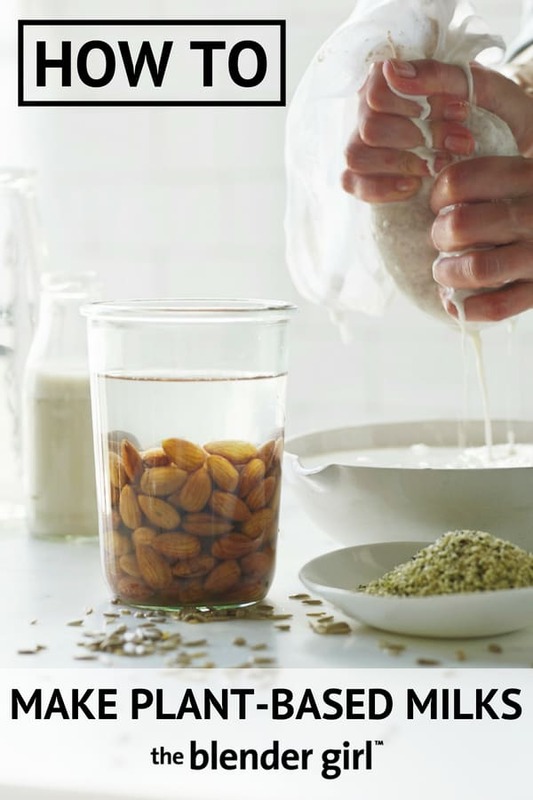 And, it is the one of the easiest plant-based milks to make as it doesn’t need straining if you use a high-speed blender. If you’re using a conventional blender, you will need to strain it to get a really smooth consistency. Coconut milk is rich, creamy, and decadent, and is fantastic for use in sweet and savory recipes. Fresh coconut milk is widely used as a cooking base in cuisines all over South East Asia, Polynesia, the Caribbean, Hawaii, and Brazil with spectacular results in dishes such as curries, stews, soups, drinks, and fragrant desserts. Traditionally, coconut milk is made by squeezing grated coconut milk through cheesecloths. Thick coconut milk is the product of the first press. This press has a thick, paste-like consistency closer to coconut cream. This thick milk is traditionally used for desserts, ice creams, and sauces. Thin coconut milk is made by soaking the fresh pressed coconut in warm water and squeezing it a second and third time. Thin coconut milk has a much higher water content, and is more suitable for use in smoothies, drinks, curries, and stews. The canned coconut cream and milk we purchase is a combination of thick and thin coconut milk with water, and some brands add thickening agents, stabilizers, and preservatives. Canned coconut cream is more concentrated and canned coconut milk has more water added. Both canned varieties have a thick, creamy texture, and beautiful forward coconut flavor that is fantastic for curries, stews, and soups, as well as ice creams, desserts, and smoothies where you want a dominant coconut flavor or really creamy texture. To make coconut whipped cream, place a can of coconut cream in the fridge overnight, open, skim the fat off the top of the can, and empty that fat into your stand mixer, and whip with some vanilla and sweetener. Concentrated coconut cream is available in tiny cans and is 100% pure coconut cream, which is just fresh coconut kernel extract. This is a fantastic option. Empty the pure coconut cream into your blender and blend in filtered water to achieve your desired consistency. This coconut cream is completely pure and great for use in recipes. Creamed coconut is sold in boxes. These blocks are the unsweetened dehydrated meat of mature coconuts ground to a fine white creamy paste. This is another fantastic option. Cut of the desired amount from the block and heat with water to make coconut cream. Boxed coconut milk is a lot more watery, and typically contains more additives than canned coconut milk. Boxed coconut milk is light and good for smoothies and baked goods when you don’t want a dominant coconut flavor. I don’t use it for curries, stews, soups, and desserts. It doesn’t have enough creaminess or flavor. Make homemade coconut milk by blending fresh raw coconut meat and raw coconut water. Hemp seeds have a rich nutty flavor similar to sunflower seeds, and when blended with water, create a nutty-flavored creamy milk that is great in savory and sweet dishes such as curries, stews, smoothies, desserts, and baked goods. Hemp milk has a similar creamy consistency to soy milk. Hemp milk is a fantastic alternative to dairy, soy and nut milks for those people living with food allergies. This superfood milk is also highly nutritious. Hemp seeds are one of the top sources of plant-based protein containing essential amino acids, and are a good source of calcium, magnesium, iron, potassium, fiber and B Vitamins; as well as omega 3 and omega 6 fatty acids. There are quite a few commercial hemp milks on the market. The texture is creamy, but the flavor can get quite grassy, which is not palatable to a lot of people. Commercial hemp milk can get quite assertive in recipes, too. Purchase organic hemp milk without additives and preservatives, and avoid any brands that use carrageenan as a thickening agent. For maximum nutritional value, and better flavor make your own hemp milk. I drink hemp milk untrained unstrained for maximum nutritional benefit because hemp seeds are such a fantastic source of plant-based protein. However, for use in recipes, strain your milk. Rice milk is a very thin, light, watery plant-based milk that is traditionally made by grinding boiled brown rice and filtered water. 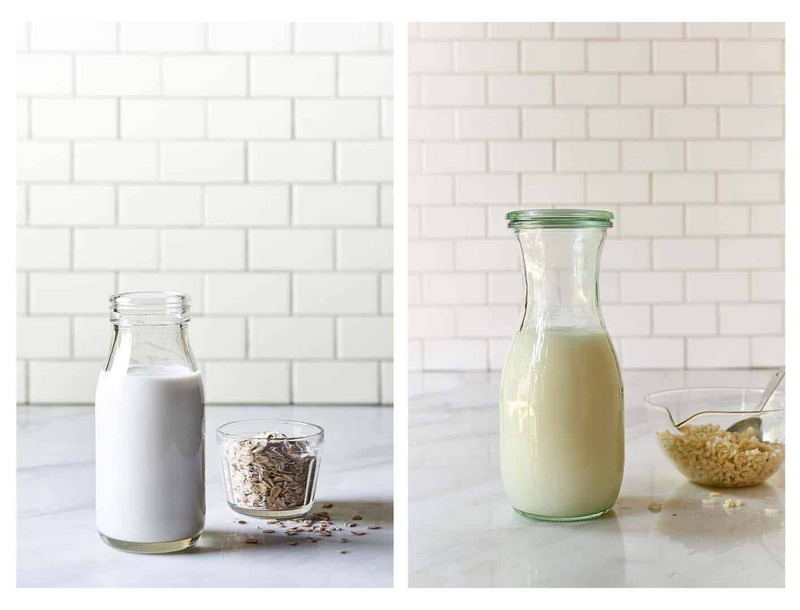 This grain milk was one of the first plant-based milks to hit the market many years ago, and is a great option for people living with food allergies to dairy, nuts, seeds, soy, and coconut. Rice milk is great for use in smoothies and pancake batters; and for topping cereals. I tend to choose plant-based milks with a higher fat content and creamier consistency like cashew milk and coconut milk in baked goods, in order to more closely replicate the quality of cow’s milk. Rice milk can be a little too watery for a lot of recipes. Having said that, I have used rice milk in muffin and bread recipes where only a small amount of milk is required with excellent results. Commercial rice milk is nearly always fortified with calcium and Vitamin D, and are thickened with carrageenan or other agents. Commercial blends can also contain polyunsaturated vegetable oils and sweeteners such as rice syrup, barley malt, or evaporated cane juice. Add that to the already high carbohydrate content and low protein content and you are basically drinking a large glass of sugar juice! I don’t use a lot of rice milk as I find it watery and tasteless, and lacks the nutritional density and depth of flavor that other plant-based milks offer. However, it is a good option for people living with food allergies. Just be sure the variety you purchase is gluten-free as many brands use barley malt. Rice milk is also inexpensive for those living on a budget. I prefer to make rice milk using soaked brown rice to neutralize the enzyme inhibitors making it more digestible. Make your own rice milk by blending soaked and cooked brown rice and filtered water, and straining. Soy milk is made by soaking soy beans and grinding them with filtered water. There is no doubt that soy milk is rich and creamy, and is the easiest way to replicate the texture of dairy milk in recipes. However, there are some issues, and for these reasons, I don’t use soy milk. Commercial soy milks are typically an emulsion of soy beans, oil, water, and sweeteners, in differing proportions. It is important to read labels. Many brands of soy milk contain polyunsaturated oils that are not health-promoting, and the sugar content varies considerably. Also, note, that a lot of soy milks are not gluten free. They can contain barley malt. The problem with soy milk. There are phytoestrogens in soy beans that can, in high amounts (or consumed with other estrogenic foods) mess up hormone balance and thyroid function in the body, and in some studies, has been shown to increase the risk of breast cancers in men and women, and effect menstrual cycles. If you have or have had a hormone-linked condition, avoiding soy is prudent. Soy milk (along with soy flours and soy protein isolates found in some vegan protein powders) are processed with solvent extraction making them nutritionally unbalanced. Soy beans contain higher levels of phytates than any other bean. These phytic acid can impair our digestion and the absorption of minerals such calcium, magnesium, iron, and zinc. Also, there are more nutritionally dense plant-based milk alternatives. Soy milk does not contain any significant natural calcium, as the kind contained in the soy bean pulp is not able to be absorbed in the body. If you are going to consume soy, fermented products are your safest bet. The fermentation process increases the bio-availability and digestibility of beneficial soy nutrients and neutralizes the enzyme-inhibitors and anti-nutrients. Fermented tempeh is the healthiest whole form of soy boasting high digestibility, concentrated phytonutrients, bioactive peptide proteins, antioxidants, anti-inflammatories, and beneficial probiotic agents. If you choose to consume soy milk, look for organic or non-gmo verified products.